<— Good stuff but a bit different from what I was anticipating. Well… the “base” of it, that is. A few of us lightly skimmed the blurb (we were hoping to go in blind) and envisioned a young married couple setting up in their new house. Would it be haunted? Or maybe a ghost love story? Ohhhhh yesssss!! We were in no matter what!! And we were highly enticed by the fear-factor warning. But… it ended up being… completely different from expected… at first. Lee: I am IN for The House even though it clearly says ”Don’t read it at home alone. Or at night. Or at all, if you scare easy. You’ve been warned!” and I check on every single one of them!!!! eeeeeeep!!! Niki: I need to wait until you read The House Maryse….. I usually read at night and live alone so I don’t want to freak myself out So I will wait for the reviews!!! Jean: Oh no Lee, I’m not sure how to take that reaction. I’m only at 15% of the House. Cheryl: Starting The House. Worried about Lee’s hmmm comment. Ok, let me just say, The House is a book for teens?? Did I miss that somewhere?? Jean: Cheryl, I know that threw me too……didn’t realize it was YA. Wondering how Maryse is liking it. Maryse? I’m only at 20%. Hope to finish tonight. Maryse: BUT!!! I’m at a super-creepy part of The House right now… Oh I thought it was sweet at first… not so sure now. Eeeeep! Cheryl: …Maryse made the comment that it is now super-creepy and not so nice now. Oh, what to do. I was a couple minutes away from DNF. I still can’t wrap my brain around it is not a “older” couple but teenagers. bev: Only 12% in The House. Um, I like it so far. I like her personality, the banter, and the bit about the house. But also a bit rough, maybe? Like we just jumped right in. Not sure how to say what I mean. Because house talk. I loved the house in Discovery of Witches. So there you have it on the “scary” factor. It’s definitely YA (the couple in question are teens in high school, about to graduate, crushing on each other and it’s fairly “tame”), and their story as a whole is quite sweet. And yes… it is a ghost story of sorts. Or spirits or magic? I couldn’t quite figure it out at first, but there was no “creeping up on us” with this one. 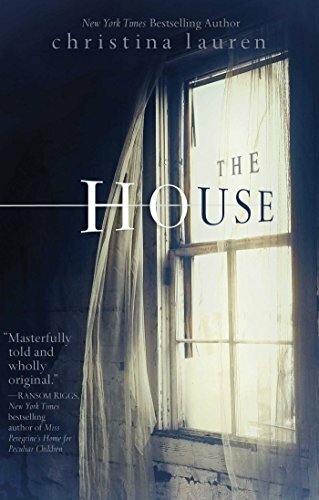 We find out from the start that “The House” is definitely haunted. Or different. Special. Endearingly so… at first. I wanted to live in the “House”. Or should I call it… “House”. Because everything in “House” has it’s own name. I felt like I was watching an episode of Pee-wee Herman’s fun house (but not soooo… hokey. I promise! LOL!!!) 😀 There was a piano called “Piano” and it taught him how to play. Chairs and tables and furniture and soft blankies that all had their own personalities, to comfort him. Not tooooo crazy (I mean… nothing talks or anything), and once you get to know the lay of the land, everything is very orderly and homey. But… you know. It’s not “the house”. It’s… House. But it doesn’t take too long before the creep-fest kicks in. And I’ll admit, the very first scene of “creepiness” definitely gave me the heebs! Who in their right mind says they’ll wait for their boyfriend in his haunted (er… I mean magically alive”) house, alone. Without him? *gasp* Oh that’s right… she likes the creepy stuff. Like I do. …there were other secrets too— ones she might never share because she knew they made her weird. Secrets like her strange appreciation of gore: depictions of fifteenth-century torture devices, paintings of people dying at the hand of swords or arrows. The idea of reanimation, zombies, exorcism. Books on the Black Plague. It wasn’t that she particularly treasured the idea of dying, or of other people dying; it was the visceral reaction to the creepy, the spectacularly scary, the otherworldliness of horror. Delilah loved the catch of breath when she was afraid, the feel of goose bumps dancing up her arms. Wow. *blush* Er… you may as well call Delilah, “Maryse”. So yeah… I would have probably offered to “wait for him” there, alone, too. LOL!!! After this one, though? We’ve learned our lesson. Delilah and Gavin have always had a connection when she defended him from bullies as a child. Now teenage, soon to graduate high school, Gavin continues to be a loner. Handsome… reclusive and brooding. And weird. Sure, he’s dated a few times, but he’s never let anyone get close. And nobody has seen his reclusive mother in years. What’s up with that? But they reacquaint themselves with each other and become close, unable to deny their mutual attraction. And realizing that she’s fascinated by esoteric things, Gavin brings her home one day. To his “House”. He should have been focused on the fact that Delilah absolutely did not belong there. He should feel protectiveness for House welling inside him instead of the odd urge to pull Delilah closer. Nobody had ever dared scale the fence that surrounded House before, and certainly no one had dared to get this close in years. This was completely new territory for Gavin, talking to another person while House silently vibrated behind him. He doubted Delilah could feel it from where she stood, but he could. Warning her before they get there of course, that his house is not like your normal house. It… magically… provides for him. He admits that his mom left him when he was just a small child (he barely remembers her) but House has raised him. And sure enough… House totally has!! Awwwwww!!!!! My heart! I LOVED House. It’s SO fun getting to know House and House’s ways. House is SO CUTE!!! Chair is sweet. Fireplace turns on to keep them toasty. TV plays the most chaste tv shows. Shed has the homemade-canned foods ready and waiting. Money just appears in the money jar each day. Freshly baked cookies waiting for him upon his arrival from school. *sigh* I wanted House, too. But… you know… anything that can bake you cookies and jarred-fruit out of mid-air can’t be trusted! Right? RIGHT?!!!! He opened one of the drawers near the stove and pulled out a couple of random utensils: a peeler, a slotted spoon, a beautiful knife with an ivory handle. “She uses utensils.” Delilah wanted to know how, but before she could ask, he said, “Do you want to take some fruit home?” The space grew noticeably warmer, and Delilah felt her eyes widen, looking instinctively to the window in search of an aggressive ray of sun. “It’s warm because she wants you to take some.” Nodding politely, Delilah took the jars of peaches and plums when Gavin handed them over. ‘Cause while “House” (and all the things that make up House) might be on it’s best behavior at first… it’s possessive nature starts showing and all I could think was RUN!!! RUN AND NEVER LOOK BACK!!!! But take some cookies with you! They’re delicious! And maybe that magical money jar!!! LOL!! Although… what happens when you try to run and somehow, House follows you? Okay never mind… leave the money jar and cookies!!! While not exactly the full-on fright-fest I was looking for (narrated via an uncomplicated writing style), this certainly had it’s fun creep-factor (and I would consider it horror… but more on a YA level). Some parts of House seem good, some not so good? I’ll let you find out. I could see this on Lifetime or ABC Family. They have scary movies on those channels, too… just not the “keep you up all night trembling even though all the lights are still on...” kind. It held my attention and entertained me well enough, although to me? Not unputdownable. If you’re in the mood for a light-horror/love story that is quite unique in its “craziness”, this one might be for you. Once I got used to the writing style, the YA-factor didn’t bother me at all, as it actually was NEEDED for this journey.You know… the whole “story-behind-the-story”. A child being raised alone… by a house?!! Fun! aawwwnn.. 🙁 I made Jody stop reading.. that’s what I get from “humming” sorry Jody!! We all have AWESOME book taste. 😉 Just our own… with a big portion of our book taste similar to our whole group. I like my books weird, too, sometimes. Weird twists, weird subject matters… weird endings. Done right, those are my FUN!!! I almost did not finish this book, but glad I did. It was unique and unforgettable. I could definitely see it as a movie! The end though….i just could have used a little more, ya know? Now I need something downright scary, like “I won’t be able to sleep at night scary!”. Join us on Saturday Jean. 😉 And I can’t promise I won’t start it tomorrow afternoon. Tee hee! I’m SO excited for Bird Box!!!! I did like it though I found it missed details in certain parts. I was waiting for scene details to happen that might have been hinted at previously, especially at the end. Does that make sense? Don’t want to give things away.